Wearing a HELMET will save your life and it’s the LAW. You should wear a bicycle helmet because they have been shown to reduce serious head injuries by eighty-five percent. Deaths associated to cycling injuries commonly occur to children under age fifteen. 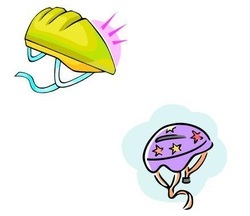 Since 1995, the Law states that anyone under the age of eighteen must wear a certified helmet when cycling. The helmet must be worn properly and must be an approved safety helmet. The fine is $29.00. The Motor Vehicle Act also states that a parent or guardian of a child under the age of sixteen years must not allow that child to ride a bicycle without wearing an approved bicycle helmet, and their fine would also be $29.00. 10. Plan bicycle outings together where everyone wears a helmet.